A stone heart cut from Chevron Amethyst and then tumbled and polished to a high gloss. Each heart is..
1 3/4" Angelite heart. Angelite is the softest energy in the mineral world. Angelite is both blue an..
Carnelian heart. These stones were worn by High Priests and Priestesses. Often used to enhance passi..
Quartz crystal hearts are clear to translucent, each has its own combination of inclusions and densi..
Fluorite can be many colors. These hearts are no exception. 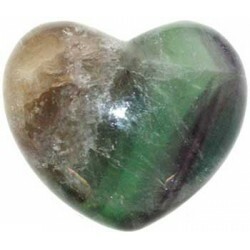 From Green to purple to grays or translu..
Labradorite heart is dark with simmering translucent color which makes this stone so loved. 1 3/4" A..
Tiger eye heart is swirls of browns, and reflective iridescent gold. Each heart has its own patterns..
Shungite is famous for its many attributes. This black heart can be used a pocket stone to help remo..